Bernard "Bernie" Sanders (born September 8, 1941) is an American politician and the junior United States Senator from Vermont. A Democrat as of 2015, he had been the longest-serving independent in U.S. congressional history, though his caucusing with the Democrats had entitled him to committee assignments, and at times gave Democrats a majority. Sanders has been the ranking minority member on the Senate Budget Committee since January 2015, and previously served for two years as chair of the Senate Veterans' Affairs Committee. He is a candidate for the Democratic nomination for President of the United States in the 2016 U.S. presidential election. Sanders was born and raised in the New York City borough of Brooklyn, and he graduated from the University of Chicago in 1964. While a student, Sanders was a member of the Young People's Socialist League and an active civil rights protest organizer for the Congress of Racial Equality and the Student Nonviolent Coordinating Committee. After settling in Vermont in 1968, Sanders ran unsuccessful third-party campaigns for governor and U.S. senator in the early to mid-1970s. As an independent, he was elected mayor of Burlington, Vermont's most populous city, in 1981. He was reelected three times. In 1990, he was elected to represent Vermont's at-large congressional district in the U.S. House of Representatives. In 1991, Sanders co-founded the Congressional Progressive Caucus. He served as a congressman for 16 years before being elected to the U.S. Senate in 2006. In 2012, he was reelected with 71% of the popular vote. 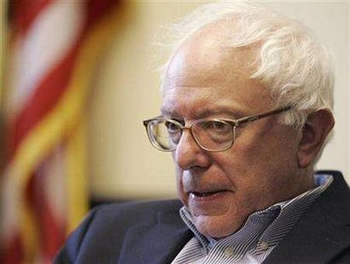 Sanders rose to national prominence following his 2010 filibuster against the proposed extension of the Bush tax cuts. Sanders favors policies similar to those of social democratic parties in Europe, particularly those instituted by the Nordic countries. He is a leading progressive voice on issues such as income inequality, universal healthcare, parental leave, climate change, LGBT rights, and campaign finance reform. Sanders has long been critical of U.S. foreign policy and was an early and outspoken opponent of the Iraq War. He is also outspoken on civil rights and civil liberties, and has been particularly critical of racial discrimination in the criminal justice system and mass surveillance policies such as the USA PATRIOT Act and the NSA surveillance programs. The Vermont senator hopes to build on the success of a widely viewed “Medicare for all” session. ... Sen. Bernie Sanders (I-Vt.) plans to hold a live, televised town hall on March 19 devoted to exploring the issue of economic inequality. ... The program will consist of a four-person panel: Sanders, Sen.
Bernie Sanders' son is running for Congress. But can he win? Sen. Mark Warner told CNN's Wolf Blitzer Monday afternoon that he is "very concerned" President Trump is breaking laws with regard to the Mueller probe and the firing of FBI deputy director Andy McCabe: CNN, WOLF BLITZER: How concerned are you, Senator, that President Trump has gone from. The Vermont senator is using his reach to try to shape a national progressive narrative. By Daniel Marans ... Sen. Bernie Sanders' televised town hall on economic inequality drew about 1.7 million live viewers during an online broadcast Monday night. ... Three co-hosts aided Sanders in his efforts: Sen. The subject of Sen. Bernie Sanders' tweet? Not music or the state of pop culture or even a topic directly affecting Cardi B's fan base of Millennials and ... The independent senator from Vermont was referencing a statement Cardi B had made in a recent GQ interview comparing President Franklin D.
Sen. Bernie Sanders has encouraged young people to get involved in politics, and one Vermonter has answered that call — by challenging the sitting senator for his ... "I hope that he may [run for president] and therefore, you know, I think the people of Vermont deserve a senator for six years,” said Peacock. Sen. Bernie Sanders, I-Vt., is bringing Luis Alcauter as his guest to Trump's speech, he said Tuesday. "I'm honored that Luis Alcauter will be my guest at the #StateOfTheUnion. Luis is not a statistic, and he is certainly not a bargaining chip," Sanders tweeted. "He is a human being who deserves our support. With more than one million people watching at home, and hundreds watching from the studio audience, Sen. Bernie Sanders, I-Vt., leaned across his desk with a crucial health-care question. “What's the quality of the Norwegian system?” Sanders asked Meetali Kakadi, an Oslo-based health researcher. Bernie Sanders to hold economic inequality conversation at Duke Buy Photos Sen. Bernie Sanders will visit Duke University Jan. 19 to discuss economic equality. Sanders visited N.C. State University April 26, 2017. Photo courtesy of sanders.senate.gov. Following the retirement last month of veteran state director Phil Fiermonte, Sen. Bernie Sanders (I-Vt.) has named a replacement to lead his Vermont office: senior policy adviser David Weinstein. ... According to Sanders spokesman Daniel McLean, the senator finalized the promotion Tuesday. “Socialist Bernie Sanders wears a $700 jacket while complaining about rich people,” a Newsweek headline blared. Sanders' ... Sen. Bernie Sanders (I-Vt.) speaks at New York City Mayor Bill de Blasio's swearing-in ceremony on Jan. 1, 2018. He was sporting a $690 coat, according to a conservative site. (CNN) On the day the House approved a major tax code rewrite -- sending new legislation to the desk of President Donald Trump -- Sen. Bernie Sanders voiced his clear disapproval. "This is a disaster for the American people," Sanders told CNN's Wolf Blitzer. "I think the Republicans will rue the day. Doug Jones' upset Tuesday night in Alabama's special election will make him the first Democratic senator from the state since 1994 — and Jones' positions show how just much the ... The Democrat said Wednesday his first congratulatory call the night before came from appointed Republican Sen.
NPR's Lulu Garcia-Navarro talks with independent Sen. Bernie Sanders of Vermont about the ongoing government shutdown. LULU GARCIA-NAVARRO, HOST: And now we return to our main story, the government shutdown. Bernie Sanders is the independent senator from Vermont, and he joins us now.